Tali Sharot of University College London investigated people’s tendency toward unsubstantiated optimism after she observed this bias in her neuropsychological experiments on memory processes of envisioning future events and consequences. She, like Shelley Taylor of UCLA decades before, argued that this bias was an evolutionary adaptation that enabled people to survive under difficult conditions. 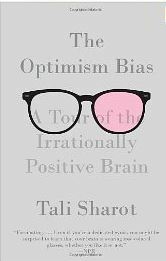 Sharot added to Taylor’s work by suggesting that a majority of people demonstrate the optimism bias by a margin of 5:3.3.
compares optimism bias to other perceptual illusions, such as sometimes-fatal spatial disorientation among airplane pilots and other frequently-cited optical illusions like “Young Lady or Old Woman”, “Vase or Two Profiles”, and Thatcher illusion. An example of optimism bias is the well-documented “superiority illusion”, that most people rate their skills, knowledge, and tendencies as above average in a variety of dimensions. Another example was identified in 1975 by Ellen Langer of Harvard, who suggested that a pervasive “illusion of control” causes most people to overestimate their ability to control events, even those over which they have no influence. This cognitive bias has been suggested as prevalent among “problem gamblers” and those who believe in paranormal phenomena. Sharot and Elizabeth Phelps of New York University extended Taylor’s early work with neuropsychological research, and reported that the brain’s frontal cortex communication with the posterior hippocampus enables people to envision future possibilities and events. They observed amygdala and the rostral anterior cingulate cortex activity when people demonstrate the optimism bias and noted that malfunctions in these brain areas are associated with a bias toward pessimism and related depression. These findings were foreshadowed by Lauren Alloy of Temple University and Lyn Abramson of University of Wisconsin in their 1979 study, which found that people with depression are better able to predict future events accurately, whereas people not burdened with depression have inaccurately optimistic predictions. Increase likelihood of people following recommended health practices like exercising, following low-fat diets, taking vitamins. Sharot suggested that increasing awareness of optimism bias can help people enjoy the benefits of this positive illusion while watching for pitfalls of unrealistic optimism. -*How do you capitalize on the optimism bias and mitigate its drawbacks? This entry was posted in Neuroscience, Resilience, Thinking and tagged Bias, depressive realism, Elizabeth Phelps, Ellen Langer, Lauren Alloy, Lyn Abramson, Optimism bias, positive illusions, Robert Rosenthal, Shelley E. Taylor, Tali Sharot on January 13, 2013 by kathrynwelds. Dear Kathryn, I Really liked your post and it´s right down my alley. You inspired me to do a little bit of digging around negativity bias vs. positivity bias.Thank you! When it comes to individual well-being and accomplishment, my gut feeling is that the potential benefits of learning how to control one´s negativity bias, as opposed to mediating the positivity bias, are far greater. Negativity bias developed to ensure continuation of life and I would see it being in the very core of human´s evolutionary ´code´. Compared to our ancestors, we are surrounded by a completely different environment with few threats (well, at least compared to million years ago). However, the bias still impacts our behavior in profound ways by constantly scanning for warning signs and possible threats. My guess is that being concerned on learning how to control negativity bias (i.e. through meditation, mindfulness or visualization practices) can offer us greater benefits than leveraging on the positivity bias. Thank you again for writing about such a great topic! Thank you so much, Emilia, for stopping by and sharing this important point about the “creative tension” between negativity bias and positivity bias. One of my earlier posts highlighted Rick Hanson’s view that “the brain is like Velcro for negative experiences but Teflon for positive ones” because He notes negative stimuli produce more neural activity than equally-intense positive ones, and are perceived more easily and quickly.